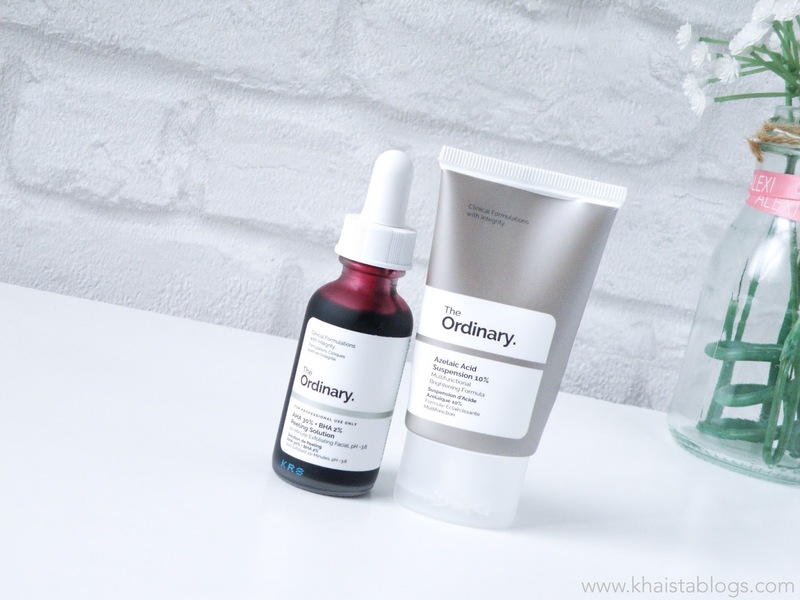 I did a huge The Ordinary haul a couple of month ago, and got many products at once from the brand. 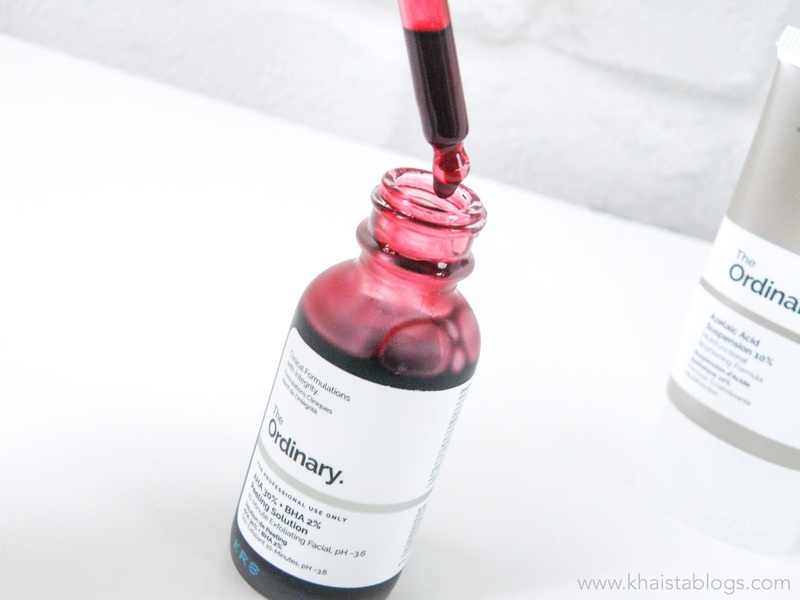 What I love about The Ordinary skincare range is that I can get products for specific skin concern without addition of several other ingredients which I already have in my other skincare products. Also, not to forget that all products are without a hefty price tag too. I already reviewed The Ordinaryfoundations. So today I am reviewing Azelaic acid and AHA 30% + BHA 2% 10-minutes’ facial. 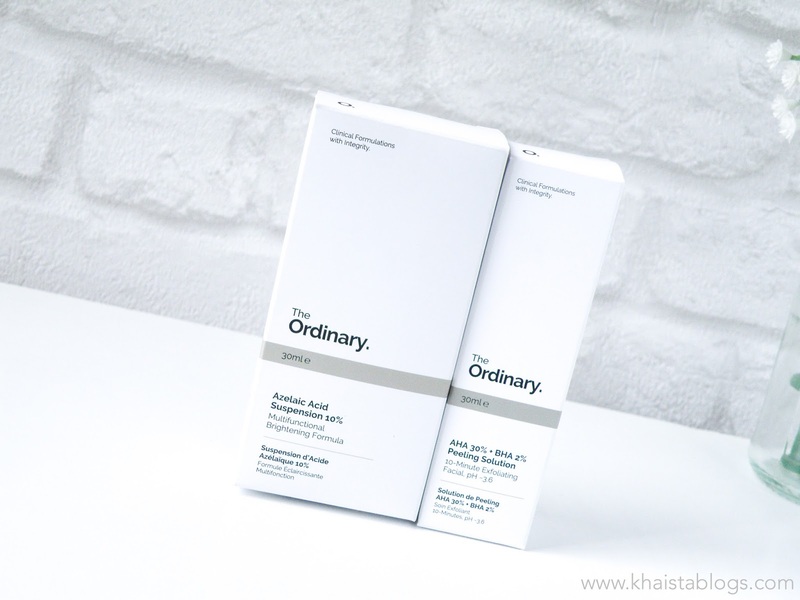 Azelaic acid 10% suspension is the product which intrigued me to try The Ordinary products. Azelaic acid is commonly prescribe for acne but it also works wonderfully on pigmentation. I have used Azelaic acid – prescription strength, in the past. Prescription strength are usually 15% to 20% and are strong creams. My dermatologist prescribed it for my melasma. Melasma is a tough form of pigmentation and getting rid of it completely is very nerve racking process. It needs determination and patience. Laser is the quick fix but it can go either way. I read some case studies where laser triggered the pigmentation instead of lightening it. So, it can be a bit of a hit and miss. In this case, topical creams and acids are the safe options. 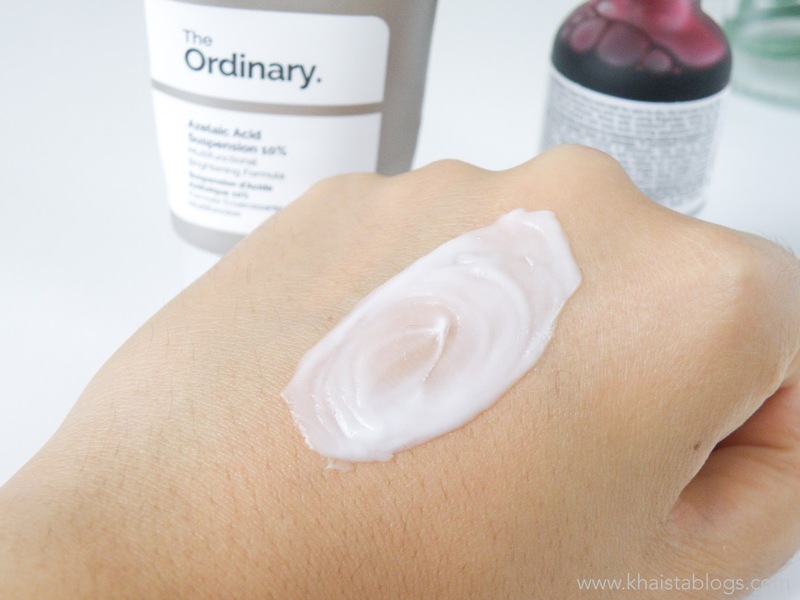 I used The Ordinary azelaic acid for one month daily at night. You only need a pea size and this 30-ml tube lasted me for 45 nights. In my experience, this product performed exactly what I was expecting. It kept my pigmentation at bay and helped me in getting more even skin tone. On a scale of 1-10 where 10 is a completely clear skin, I will scale the performance at 6. If you want to use it on much weaker pigmentation then this number can go high but in my case, I consider it the best I could get from one tube. I will be getting a new tube with some other products from the brand soon. Although The Ordinary suggests to use it at day time too but I will recommend otherwise. I didn’t experience any sensitivity while using it but azelaic acid can irritate and make skin sensitive to direct light. Not only sun but exposure to strong artificial light can also trigger pigmentation and sensitivity. That’s why always wear SPF during day time. It can be mix with moisturiser to reduce the risk of irritation. It is quite heavy on silicon and gives matte finish to the skin which I don’t understand really because I will never wear it during day time under my foundation. After first time using it, I felt tingling on my skin and it lasted for about ten minutes. Tingling sensation was pretty strong and I was worried that I might get any reaction. But next day it was not that bad. On third night, the tingling was like the first time. After considering my other products, I realised that I was using Elemis biotec skin energising day cream which has lactic acid. Azelaic acid was reacting with it. Once I stopped using Elemis moisturiser, azelaic acid worked fine for me. But light tingling and a bit of cooling effect is normal with such products. Azelaic acid is available for £5.50. AHA 30% + BHA 2% peeling solution is a mixture of glycolic acid, lactic acid, citric acid (AHAs) and salicylic acid (BHA) with addition of hyaluronic acid, vitamin B, Tasmanian pepperberry and black carrot. It is a 10-minutes exfoliating facial. I use it once a week for deep cleansing. It is a slightly thicker, deep red liquid, use as a mask for exfoliation and to unclog block pores. It looks quite scary to put on to be very honest because of the colour and consistency. AHAs dissolve the dead skin and help to speed up the skin turnover for more youthful and rejuvenated skin. BHA also exfoliates skin but at the same time it goes a little deeper in pores to clean them and removes blackheads and reduces blemishes. This solution is very strong and need to be used with great caution. Before using it, you must be aware of how your skin reacts to direct acids. Because if your skin is sensitive and prone to irritation easily or broken, it will make the skin condition much worse. Although The Ordinary products are tried and tested and suitable for most skin type, it is better to do a patch test for safety. Tasmanian pepperberry is added to help reduce the irritation by acids. The application is simple. Apply few drops on clean, dry face and leave for 10 minutes. Never assume or count the minutes in head. It must be precisely 10 minutes on a watch. After this wash it off with normal tap water and pat dry skin. The results are promising. It gives the most glowing skin you can get after using any exfoliator. It improves skin surface by reducing texture for more glowing fresh complexion. I am absolutely in love with this peeling solution. Because I take a great care while using it so till now I didn’t experience any irritation or skin problem with it. It can tingle a little but that is totally normal because of the acid nature and lower pH than skin. This peeling solution is available for £6.30. It is very good brand to familiarise yourself with basic skincare ingredients. I haven't heard of these types of products before but they sound great for problem skin. The packaging is beautiful, and it sounds like a fantastic product! I'd worry I'd forget it was on though! I have a lot of blocked pores at the moment so I may try this out. Hopefully it wont irrate my skin! I've heard so much about The Ordinary but still haven't tried anything for myself yet. The acid peels sounds amazing, that's definitely one I'd like to get. 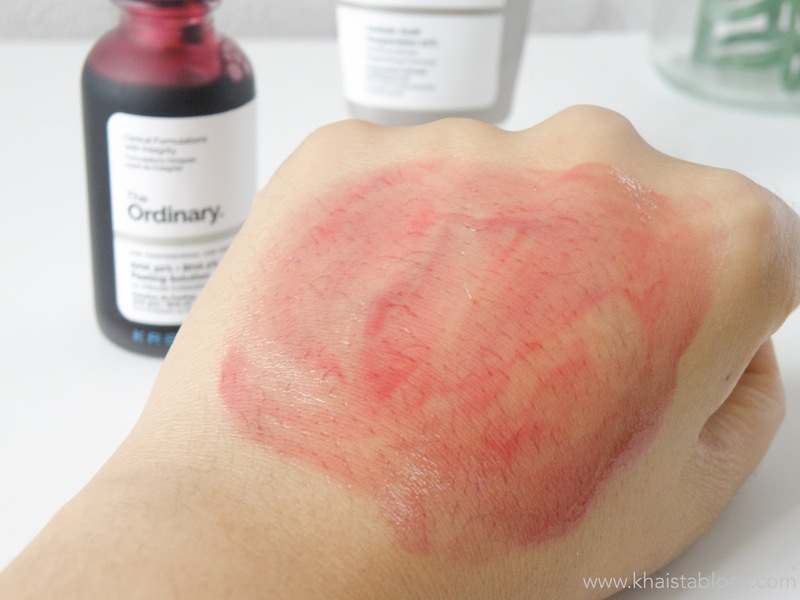 I've seen so many people post about The Ordinary products, but haven't tried them! Do you happen to know if they are cruelty free at all? Yes they are cruelty free and vegan too. I am definitely going to try these products, they sound amazing. It is brilliant product. You will love it. now my primary Doctor recommended me this melasma cream and just for 3 weeks it really looks amazing. Very satisfied! This is really true!"